Apple’s new iPhone 7 and iPhone 7 Plus are just a few days away with launch in several territories – including the US – scheduled for September 16. 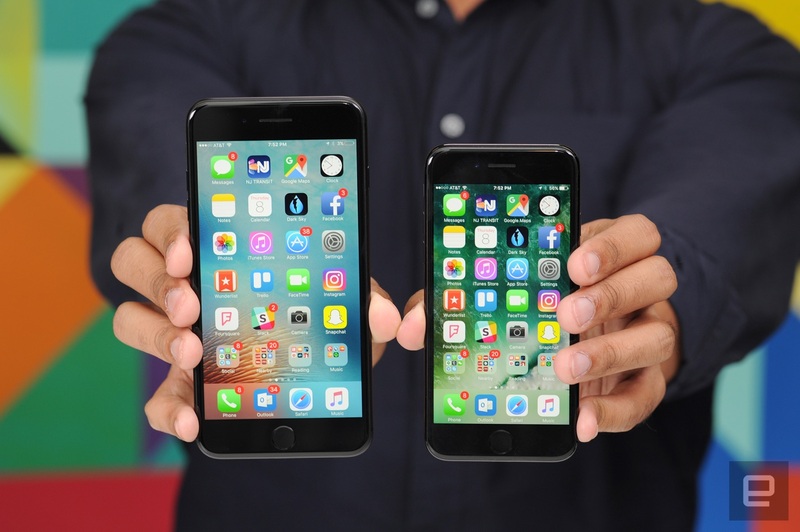 Although this year’s models don’t feature the revolutionary redesign that some were hoping for, Apple has packed a decent amount of new features into the 2016 iPhones. Here’s what some of the early reviewers are saying. But really, once you put the iPhone 7 in a case, it looks exactly like an iPhone 6. And if you get a jet black model, you’ll want to get it into a case immediately — my jet black review unit scratched and scuffed almost instantly, and the only time it’s remained fingerprint-free is when we literally handled it with white gloves for the photo and video shoots accompanying this review. Apple is being unusually open about the propensity of the jet black finish to scratch, but beyond that, I’d get the matte black anyway — it just looks meaner. Apple achieves this finish simply by polishing — with a special process, of course — the aluminum alloy. The very same material covers my matte-finish iPhone 7 Plus black test unit. Both finishes feel great in the hand, but the Jet Black iPhone 7 is a bit of a fingerprint magnet. As the Apple fine print warns, it is susceptible to micro-abrasions, dozens of which I can see on the iPhone 7 now, if I look closely. If you’ve ever used haptic feedback on a jailbroken iPhone or an Android phone, you might have noticed how, no matter what buttons or keys you tap, the vibration feels exactly the same. This is due to how crude most vibration motors are. The Taptic engine is far, far more advanced and can offer different signals to the user based on what they’re doing. The engine was introduced in the iPhone 6s, but this is the first time Apple is using it to replace a button, and the first time it’s opening it up to developers. There is going to be a lot of talk about the other features of the iPhone, but I believe that the Taptic Engine and its developer API are going to be the sleeper hit here. We’ve had an entire era of using the iPhone without it responding to us physically — that is over. I’d guess that a bunch of cool uses for the Taptic Engine are on the horizon and it could lead to better usability for the impaired and even some new interaction models that we haven’t seen yet. But how does the virtual home “button” work? Great. Fine. Pretty much a flawless transition in my opinion. Apple tells us that only two of the A10 Fusion’s cores can be lit up at any one time and that iOS automatically decides which tasks light up the low-power cores and which tasks hit the high-performance cores. It’s meant to be entirely invisible to developers, and early big.LITTLE implementations worked in the same way. More recent ARM chips have allowed both the high-performance and low-power cores to be enabled at the same time, but Apple has decided against it, either because it doesn’t actually improve performance much or because it wanted to keep things simple on the software side. While most other mobile chipmakers chase core count—anywhere from four to 10 cores is de rigueur in the Android world—Apple has chosen to remain focused on providing fewer cores with high single-core performance. That strategy has worked and continues to work well for Apple, and the company’s chips continue to top the charts in multi-core performance metrics while completely blowing away other ARM chipmakers in single-core performance. As always, the new iPhone is a better iPhone. Its new A10 Fusion processor is ludicrously, outrageously fast, somehow even more so than last year’s (already crazy fast) A9. It’s a quad-core processor, with two cores dedicated to running simple tasks and two to more taxing ones. That means if you don’t really game or watch high-res video on your phone, your battery life is going to be extraordinary. When I used the iPhone 7 for only simple things, I got more than 24 hours of life from the 7, and nearly 48 from the 7 Plus. As soon as I fired up Riptide GP: Renegade and streamed Halt and Catch Fire, I had to charge once during the day or be left stranded by 9pm. There’s really nothing to say about the absence of the headphone jack except that it’s not there, which really is annoying sometimes. Like when I’m on the train, and can’t charge from an external battery and listen to music at the same time. Apple’s solution to these gripes is a pair of wireless, $159 AirPods, but your answer will probably be to buy yet another awkward dongle that lets you still plug your wired headphones in. That’s another gripe; any time I left the tiny white connector at work, I couldn’t use my preferred cans. I’m into the idea that wireless is the future, but getting there is going to be painful and adapter-filled. Keep it tuned to TechSpot as we plan to have our review of the iPhone 7 Plus ready in the near future.